If your PC or laptop is always connected to internet, then using online word processing application like Google Docs is more convenient option as against installing Microsoft Office software on the computer. Google Docs offer rich word processing, presentation and spreadsheet creation and editing online without need to install anything on the PC. 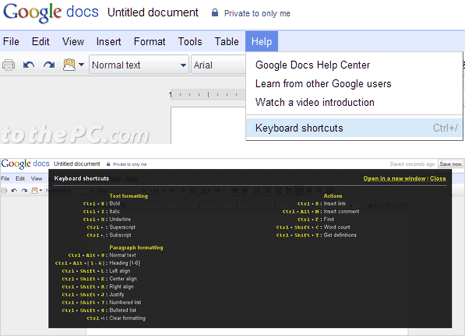 Further, you can quicken up the process of working with Google Docs document files by using keyboard shortcuts for the same. 1. Goto docs.google.com to open any Google Docs document window. 2. Then goto Help > Keyboard shortcuts to open listing of shortcut hotkeys for Google Docs. Alternatively, you can press Ctrl + / keys to pop-up keyboard shortcuts box. If you are a Mac user, then use shortcuts below by replacing Ctrl with Command key (or ‘Apple’ key), and Alt with the option key. Besides Google Docs application keyboard shortcuts, you can also learn on F key Windows 7 shortcuts for quicker working on computer.